Coffee Monday 29. & Tuesday 30. 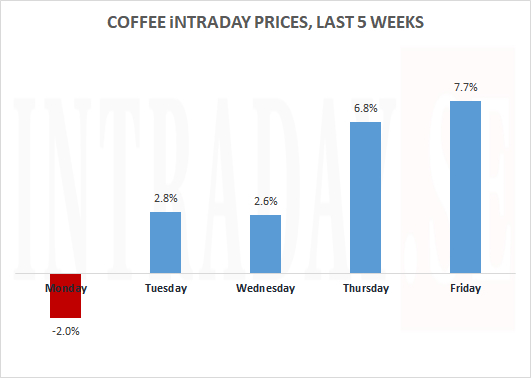 Coffee prices have been strong lately, after testing its summer-lows of 2006 in September. 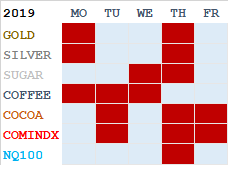 Monday has definitly produced the weakest intraday results of the week, and Friday the really strongest. 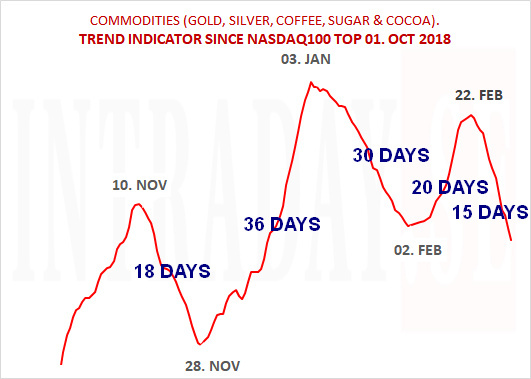 Looking to the upcoming tradingweek, the chart below displays a mapped pattern for Monday and Tuesday based on intraday data. 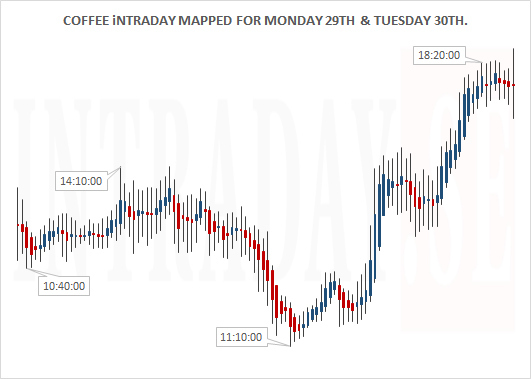 Viewing the 10 minute bar chart above, Monday the 29th seems to be a sideways to down day. 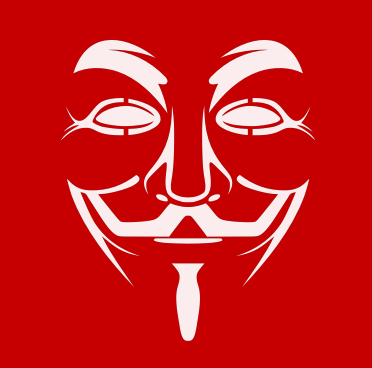 Tuesday the 30th around 11:10 CEST looks to be the first interresting timewindow to watch in conjunction to the last tradinghour later in the day. Only time will show how this map turns up against upcoming actual coffee prices. ..and here are the actual traded coffee contracts below. 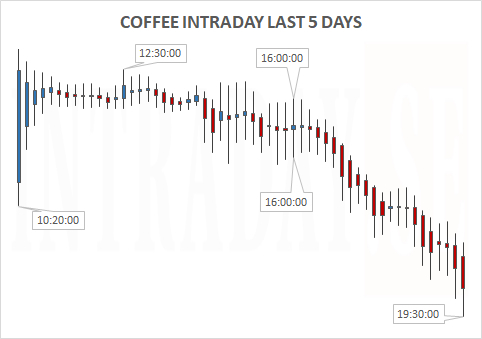 Coffee prices intraday last 5 days, times are GMT + 1 HR. 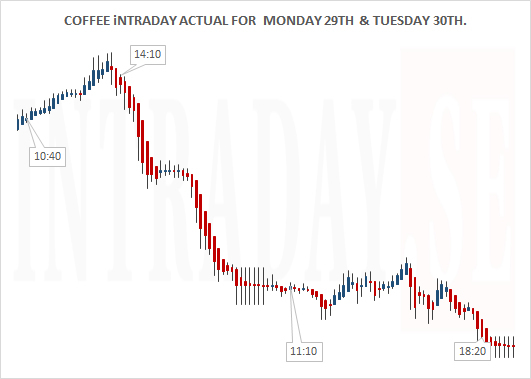 The diagram above shows you how much Coffee prices fluctuate intraday. 2018 shows the tightest tradingrange. We will come back to what times of the day which could typically mark high and lowpoints. 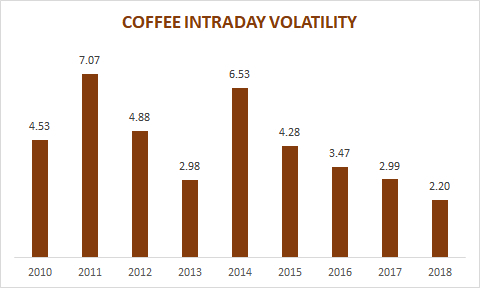 Coffee moves in a range averaging 1.9% per day this year compared to 2.2% in 2017.